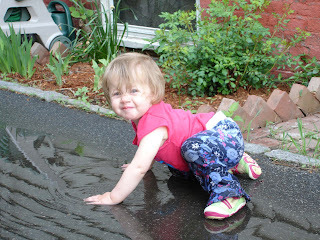 Here's Kaylee in my driveway this morning getting soaked in a puddle from last night's rain storm. I had to change her clothes before we left the house at 8:00 AM. 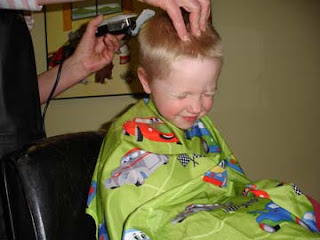 Eric getting his first hair cut with clippers. He was extraordinarily good about the whole ordeal, which took a half an hour. I was driving down Rindge Ave today in Cambridge behind a bus in a rainstorm. The bus made a sudden stop at the intersection of Cedar and Rice Streets. It's flashers turned on and I waited calmly because I thought we were just stopped to pick up or drop off a passenger. But I was wrong. I looked to the left of the bus and the driver had gotten out of her comfortable seat and was escorting a blind person across the crosswalk on the noisy flooded street. She rushed back into the bus and pulled away from the curb. All I can say, is YOU GO GIRL. What an unbelievably kind thing to do. The storm was loud and it would have been very hard to hear the cars above the noise of the rain on an umbrella. And the driver rushed out in the rain to help him. She got very wet in the process.